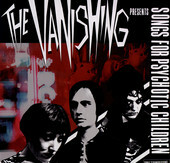 Songs for Psychotic Children, the debut from San Francisco-based post-goth outfit The Vanishing combines new wave excitement with looming goth sensibilities, the result a wicked, and sometimes chaotic blend of moods and textures. With front woman Jessa Eva (ex. Subtonix) at the helm, her sends chills up your spine, while the synth and rhythm section team up to make you dance. Yet another eerie couplet, or is it? Dancing while feeling the chills of Eva's voice and the eerie guitar textures that line the record, you can't help but feel a little stiff, and curious, the result of a twisted, intoxicating package that melds two very different sounds together and somehow, without forcing it, makes it work. With no one else really out there like them, The Vanishing improves on the wheel and gives you a ton of fun while they're at it. Dance and cry to Songs for Psychotic Children. I'll give it a B-.